Mark Gallo is a Field Media Manager for Anheuser-Busch in the Pacific Northwest. He develops, plans, and executes cross functional/platform media plans using designated brand strategies in conjunction with 30 independent AB wholesalers. Mark's expertise resides in media/sponsorship valuations, contract negotiations, and building relevant brand connections. Recently, Budweiser executed a “Poolball” campaign that went viral and was deemed a huge success in Argentina with consumers. Sticking with bar games, Mahou & Madrid Table-Soccer Federation created an entire event revolved around “foosball.”Spain’s legacy with foosball is long and well documented. Mahou partnered with two of the stars of Spanish football: Iker Casillas (Goalkeeper of Real Madrid) and David Villa (Striker of Barcelona) to be the face of this campaign. 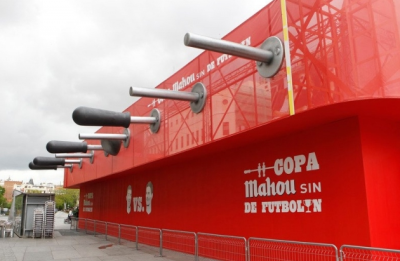 Mahou erected a large stadium resembling an actual foosball table where 96 teams (Evenly split to support each soccer star) competed to win tickets to an upcoming Real Madrid vs Barcelona, autographed merchandise, a party with the 2 stars and much more. Mahou found a clever way to promote the intense in-country soccer club rivalry. Generating buzz is one thing that Mahou anticipated. Their ultimate goal is to make relevant connections with consumers who will describe the brand as their “favorite” and act accordingly.